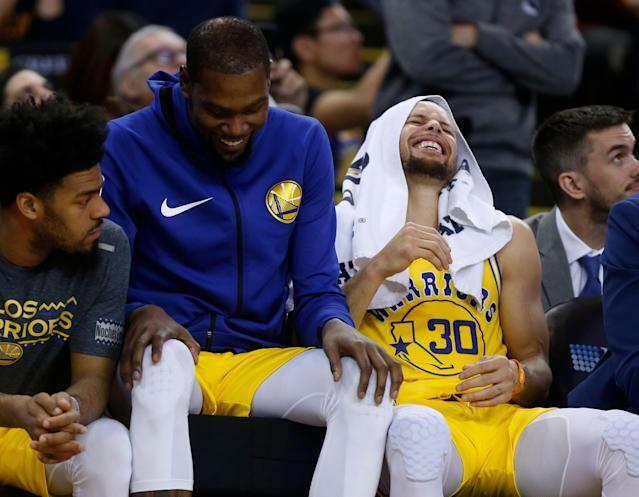 After missing two straight games with a right ankle sprain, Golden State Warriors forward Kevin Durant will return to action Monday in a potential first-round playoff preview against the San Antonio Spurs. Durant initially suffered the injury on March 10 during the fourth quarter of a loss to the Phoenix Suns when he landed awkwardly on Deandre Ayton’s foot. Fortunately due to a slow schedule, he only had to miss two games, and he nearly played on Saturday, although head coach Steve Kerr opted to give him more rest. The Warriors have managed without Durant and actually won two of their biggest games of the season on the road against top-five teams in the conference. On Wednesday, they edged the Houston Rockets, 106-104, before shutting down the Oklahoma City Thunder, 110-88 on Saturday. Golden State continues its journey through the Southwest to face a third straight playoff team in the Spurs. The teams have split their first two matchups, although the Spurs took the only game in San Antonio, 104-92. There’s plenty on the line for the game, especially considering that the teams could easily meet in the playoffs. Golden State is only up one game on the Denver Nuggets for the top spot in the West, while San Antonio is a half game ahead of the Utah Jazz and Los Angeles Clippers for the final two playoffs spots. An 8-1 or 7-2 matchup could certainly be in their futures. The Warriors also have games scheduled for Tuesday and Thursday, so it should be interesting to monitor Durant’s minutes. It seems unlikely that he will meet or surpass his 35.4 minutes per game average three times in four nights coming off the minor injury.